70cm antenna: 16-element RHC polarized yagi. The specs. are 14.07dbc forward gain (between 435 and 436 MHZ) Front to back ratio 19db, E 36.4 degrees, H 40.2 degrees and overall boom length is around 70 Inches. Has 8 horizontal and 8 vertical elements with 1/4 wavelength spacing. Price is under $200 including the phasing lines. 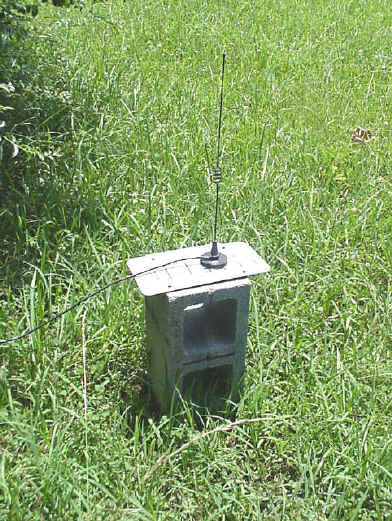 These are available for purchase from Pete at the GACA (Gulf Alpha Communications Antenna Inc) website at http://www.gulfalphaantennas.com/ - sometimes he sells them on eBay as vhfantennas. 2-meter antenna: Cushcraft 4-element vertically polarized yagi. Rotator: I use a Yaesu G-5500 AZ/EL rotator (not shown) - I'm using UniTrac for rotator and radio tuning automation. Also - bought another FT-847 to replace the one I sold a few years back. Not shown: Radio Shack 10-meter, G-5500 rotator interface, Radio Shack power supply, MFJ power distribution, power inserter for Down East Microwave 13ULNA, and 3733 TranSystem converter.